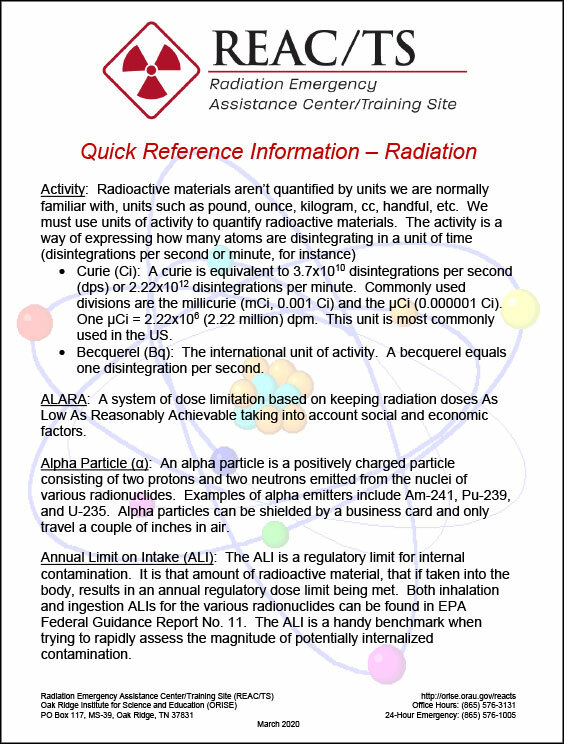 The Radiation Emergency Assistance Center/Training Site (REAC/TS) at the Oak Ridge Institute for Science and Education (ORISE) maintains a collection of radiation emergency medicine information and resources that support the medical response and treatment of victims. Resources include technical reports, pharmaceutical package inserts and videos. REAC/TS physicians and health physicists are published in a number of scholarly publications related to the medical management of radiation injuries. This guide, developed by REAC/TS physicians and health physicists, provides information to health officials and the public better understand radiation and radioactive contamination. REAC/TS has developed informational videos that address specific questions about radiation exposure. This book includes some of the most renowned medical radiation experts from around the globe sharing case studies and research along with cutting-edge technologies and procedures for diagnosing and treating radiation injuries and illnesses captured from Fifth International REAC/TS Symposium on the Medical Basis for Radiation-Accident Preparedness. This document covers the basics of radiation and provides the basic information needed for the medical management of victims of radiation incidents in an easy-to-understand manner. To help disseminate the most accurate dose estimates and models, ORISE has made available several compendia of dose information related to radiopharmaceuticals. Package inserts are available for radiation treatment pharmaceuticals calcium-DTPA, zinc-DTPA and Radiogardase (Prussian Blue).